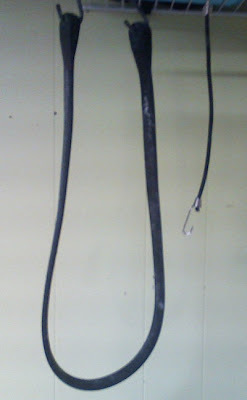 My post from last summer about finding bungee cords on the side of the road, was for some reason, one of our most-viewed blog posts of all time. So, I figure people must be interested in hearing about bungee cords, so here's an exciting update. During my rides to work just since the beginning of this year, I found both the record largest and record smallest bungee cords of all time! These were found along Rt 91 between Hudson and Twinsburg, apparently a popular bungee-cord hangout spot. The small ones are sweet. I use them on my pannier racks all the time. I have yet to buy a single one though; I found 5 or 6 in the last year we lived in Ohio. All of them were along Truxell or 303.